Reach Athletes are a force to be reckoned with. They push limits. They raise the bar to new heights. “Quit” is not in their vocabulary. Why? Because they know they have the power to cross that finish line and together make a real, tangible difference in the lives of families battling cancer. When you register for an athletic event and fundraise on behalf of our families, you join this like-minded community. Continue reading for two amazing new ways to get involved through our charity bibs. 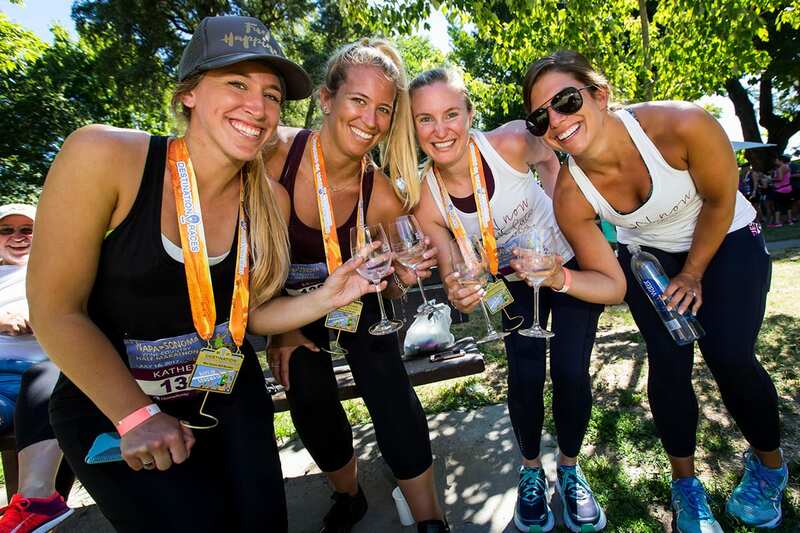 Runners enjoying the post-race festivities at the Napa-to-Sonoma Wine Country Half Marathon. Family Reach is joining Destination Races for their Napa-to-Sonoma Wine Country Half Marathon this summer! This 13.1 mile course winds its way through rolling vineyards, scenic horse ranches and gorgeous reservoirs. Celebrate your accomplishment in style at the Lagunitas Beer Garden, where you’ll enjoy delicious beer and wine from over 35 local vineyards. This bucket list adventure sold out within minutes, but our charity bibs are up for grabs. Don’t miss out! Contact Amanda Bruneau at abruneau@familyreach.org to register. Thousands of runners hit the streets of Boston for this special race. Join Family Reach in the Run to Remember half marathon and five-mile race and pay tribute to all fallen first responders. This Boston race takes runners along the Charles River and through each of the city’s quintessential locations, including the Seaport World Trade Center, Boston Public Garden and historic neighborhoods like Beacon Hill, Back Bay and Commonwealth Ave. The event boasts a three-day expo with activities for all ages! Contact Amanda Bruneau at abruneau@familyreach.org to register. Why Run for Family Reach? Cancer cuts many household incomes in half as patients and caregivers put careers on hold because of treatment needs. This forces them to make dangerous decisions – do they skip chemotherapy to pay their mortgage? As a Reach Athlete, you’re joining a community of individuals committed to raising funds and awareness for families fighting cancer. Every dollar you raise ensures they have the resources needed to maintain access to treatment, put food on the table and keep a roof over their heads, ultimately improving their loved one’s chances of survival. Interested in learning more? Contact Amanda Bruneau at 617-480-5636 or abruneau@familyreach.org.